Long Term Player Development is Hockey Canada's hockey specific response to Sport Canadaʼs Long-term Athlete Development model. LTPD is an athlete centered philosophy that focuses on the athlete from their first involvment in hockey through to their transition to lifelong activity in the game. The LTPD Program is a framework that establishes development pathways for both athletes and coaches as well as for developing new initiatives and programs. Simply put, Long Term Player Development is a framework to maximize a player’s potential and long term involvement in hockey over the course of their life. 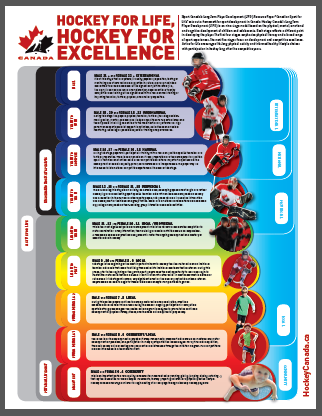 Hockey Canadaʼs Long Term Player Development Program is an eight-stage model based on the physical, mental, emotional and cognitive development of children and adolescents. Each stage reflects a different point in developing the player. The first three stages emphasize physical literacy and a broad range of sport experiences. The next five stages focus on development and competitive excellence. Active for Life encourages life-long physical activity and informed healthy lifestyle choices with participation in hockey long after the competitive years. Click on the LTPD Pyramid to the right to view Hockey Canada's LTPD Manual.